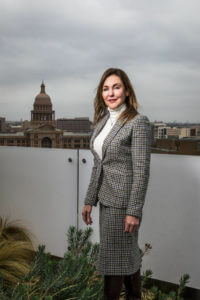 Former Texas chief privacy officer Elizabeth C. Rogers ensures her clients meet data privacy laws. The learning curve can be steep when someone becomes the first in any given role. Elizabeth C. Rogers (J.D. ’88) knows this well. Before becoming a cybersecurity business lawyer in Austin, Rogers was the first chief privacy officer for the State of Texas. She created the Statewide Information Privacy Advisory Council, which is now the Statewide Information Security Advisory Committee (SISAC). The purpose of SISAC is to promote best practices among its members and make recommendations to the Texas Department of Information Resources. As a cybersecurity business lawyer, Rogers works with her clients to ensure they provide adequate data protection and comply with data privacy laws. She also notifies them of potential vulnerabilities. Rogers also serves on the Cybersecurity Task Force for the Greater Houston Partnership. Many cities are beginning to transform into “smart cities,” using data to improve quality of life. The ideal smart city will be an intersection of innovation through technology, cybersecurity preparedness and privacy, she said. Her St. Mary’s Law education ranks high among the many things for which Rogers gives thanks. Years later, she still keeps in touch with fellow alumni. She is also a former president of the Law Alumni Association and its Austin and Houston chapters. “The sense of being a part of the St. Mary’s family, whether as friends with dedicated members of the administration or with alumni — who are like my brothers and sisters — grounds me and guides me to this day,” Rogers said.